Each year trade group Intellect, the voice of the UK’s technology industry, brings the entire entertainment ecosystem together at its Consumer Electronics Conference. As Intellect prepared to promote the event their marketing team turned to us to create an infographic flyer to accompany its email marketing. 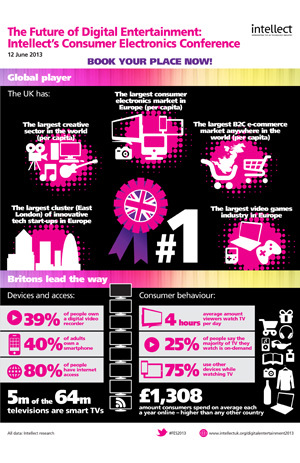 The infographic explains in a visually striking way the UK’s number one position in consumer electronics and B2C e-commerce, and shows how Britons are leading the way.